Pruning is the most common tree maintenance procedure and is an essential part of any tree maintenance program. When properly applied, pruning works in conjunction with a Plant Health Care Program to help reduce insect & disease infestations. The development of low limbs, structural branch defects and dead branches occur when pruning is not performed. Wood Acres adheres to the standards presented in ANSI A300 (American National Standards Institute). is the removal of live branches and stems to influence the orientation, spacing, growth rate, strength of attachment and ultimate size of branches and stems. Structural pruning is used on young and medium-aged trees to help engineer a sustainable trunk and branch arrangement. If young trees are pruned to promote good structure, they likely will remain serviceable in the landscape for more years than trees that have not been structurally pruned. is the selective removal of dead, diseased, detached and broken branches. This type of pruning is done to reduce the risk of branches falling from the tree and to reduce the movement of decay, insects, and diseases from dead and dying branches into the rest of the tree. 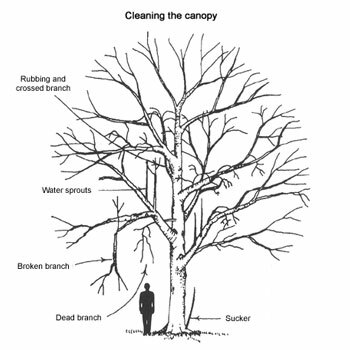 Cleaning is the preferred pruning type for mature trees because it does not remove live branches unnecessarily. is the selective removal of small live branches to reduce crown density. Proper thinning retains crown shape and should provide an even distribution of foliage throughout the crown. Thinning increases sunlight penetration and air movement through the crown. Not more than 25 percent of the crown should be removed within an annual growing season. is the selective removal of branches to provide vertical clearance. Crown raising shortens or removes lower branches of a tree to provide clearance for buildings signs, vehicles, pedestrians and vistas. Clearance sometimes can be achieved by shortening some of the low branches rather than removing them. removes branches and stems to decrease the height and/or spread of a tree or shrub. This type of pruning is done to minimize risk of failure, to reduce height or spread for utility clearance, to clear vegetation from buildings or other structures or to improve the appearance of the plant. Occasionally, the entire crown is reduced. removes branches, sprouts and stubs from trees and shrubs that have been topped, severely headed, vandalized, lion tailed, broken in a storm or otherwise damaged. The goal of restoration is to improve a tree or shrub’s structure, form or appearance. All cuts are to be made as close as possible to the trunk or parent limb, without cutting into the branch collar or leaving a protruding stub. Bark at the edge of all pruning cuts should remain firmly attached. All branches too large to support with one hand will be precut to avoid splitting or tearing of the bark. Where necessary, ropes or other equipment should be used to lower large branches or stubs to the ground. Treatment of cuts and wounds with wound dressing or paints has not been shown to be effective in preventing or reducing decay and is not generally recommended for that reason. Wound dressing over infected wood may stimulate the decay process. Equipment that will damage the bark and cambium layer should not be used on or in the tree. For example, the using of climbing spurs (hooks, irons) is not an acceptable work practice for pruning operations on live trees. Sharp tools are used so that clean cuts are made at all times. All cut limbs are removed from the crown upon completion of the pruning.